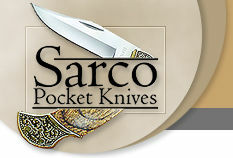 For the casual collector, Sarco Pocket Knives is your opportunity to find the best in both new and antique knives. We search the nation for the most sought after collectible knives available. To bring you the highest quality in new blades, we cover the world. Working closely with the top domestic and imported knife manufacturers, we can ensure your satisfaction and your continued trust in our company. And for those new to cutlery, you’ll have the confidence to select the right knife the first time. Whether you’re looking for a new family heirloom or a gift for a special event, our experts have taken the guesswork out of the equation for you. Every single antique offered has been reviewed for authenticity. Since we offer only the finest quality in new pocket knives, you can browse our online catalog secure in the knowledge that you'll be satisfied with the Sarco Pocket Knives experience. Our newest featured item is a personalized knife with natural wood handle. Designed to our demanding specifications, this beautiful blade is the perfect gift for many occasions. In addition to being great groomsmen gifts, you may have just found the perfect Christmas gift!